When was the last time you bought a physical product that delivered an awesome experience? If you’re a Onewheel rider, you probably know the answer. Onewheel is a personal electric transportation vehicle that looks something like a powered skateboard, but feels much more like snowboarding on fresh powder. Onewheel is the creation of Kyle Doerksen, founder of Future Motion and inventor of Onewheel. “I grew up in western Canada and I loved that floaty feeling of snowboarding on powder and I wanted to have that experience while riding around town.” . Product innovators like Doerksen and Future Motion are typically leaders in their space, bringing a vision to physical form and creating a market where none previously existed. But being first to market doesn’t necessarily guarantee long-term success. Future Motion has to move quickly to stay ahead of the fast-followers looking to cash in with copycat ideas. That means constantly innovating to make the Onewheel go faster and farther than the competition. To get there, Future Motion relies on rapid prototyping with 3D printing as a big part of its design philosophy. another reason why Future Motion engineers rely on FDM 3D printing. “The ability to 3D print can definitely decrease the time it takes to iterate,” says engineer Beau Robertson. That kind of rapid idea development is what helps Future Motion keep the competition at bay. Functional prototyping gets more demanding when the product is a moving vehicle, even a small personal electric vehicle like the Onewheel. Designed to emulate the carving action of a snowboard or surfboard, it’s inevitable that riders will want to push their Onewheel to do more. 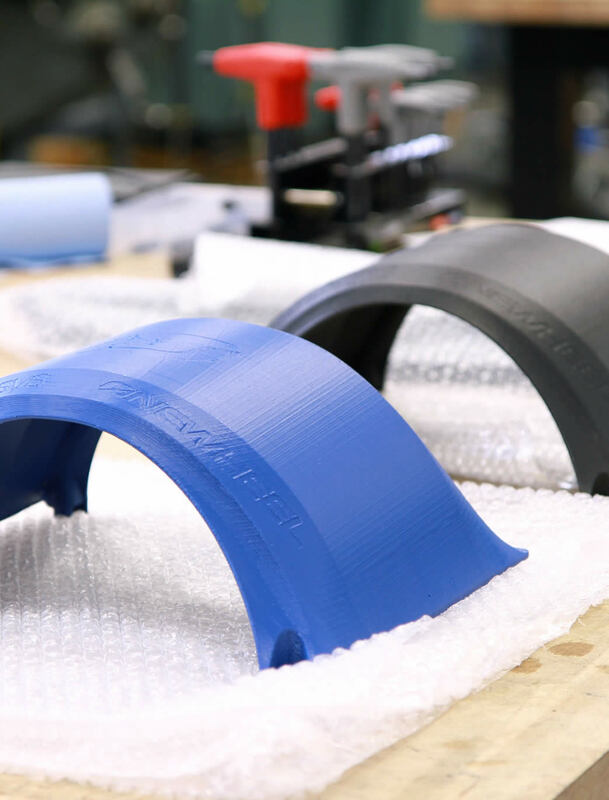 3D printed fender prototypes made from ASA (blue) and FDM Nylon 12CF (black). Two of Onewheel’s key structural parts are its aluminum side rails. But trying out a new rail design calls for time-consuming machining, and puts the brakes on fast idea implementation. As a solution, Future Motion went back to their FDM rapid prototyping philosophy but this time, employed FDM Nylon 12CF™, a carbon fiber-filled thermoplastic strong and rigid enough to support a Onewheel rider. “The nylon-12 (carbon fiber) gives us the ability to prototype a part that we would typically want to machine out of aluminum, and be able to test it and use. We can iterate more quickly this way,” says Robertson. 3D printing with carbon fiber nylon that’s strong enough for functional prototyping lets Future Motion innovate fast and refine the Onewheel, helping maintain their market leadership. Learn more about 3D printing with carbon fiber material. "We can print a piece that previously only metal would have been strong enough to meet our performance needs. Now we can print it out of carbon-filled nylon and actually bolt that up and ride it, which really helps us work faster and try new things."